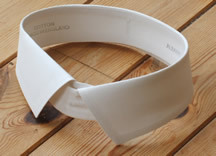 Soft Cotton Day collars Sizes 14.5" (37cms) to 17.5 (44cms). For sizes above or below please contact shop. Price includes VAT. (£6.63 ex VAT).